Dumbstruck, a word meaning “without words”, is an apt first response to the stunning image in the Adbuster #OWS poster – it’s as if our captivated eyes drain the sum of our available brain power. When we try to tell someone what we’ve seen our words are somewhere else. So we go looking for someone else’s words. A quick trip to the internet—Google: ballerina bull occupy wall street—turns up “zen koan” and “the collective consciousness”, “a really beautiful graphic”. Towards the top of SERP-1 there’s a connection to a specific card from the Tarot deck: Strength. 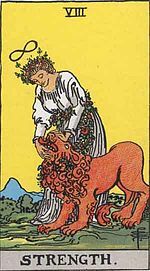 Wiki tells us the generic Strength card pictures a woman with a powerful but docile wild animal, typically a lion. The card promotes strength of character (discipline, patience, composure, etc) over strength as brute physical power. Certainly appropriate to the context of #OWS but our picture’s dancer doesn’t appear to have tamed the bull. Visually, professional bullriding is in play. Where the (intrepid? foolhardy? reckless?) cowboy marshalls strength and specialized equipment to overcome the physics of an ill-tempered bull for a few gravity-defying seconds, a serene dancer maintains a sustainable connection from the slightest of toeholds. 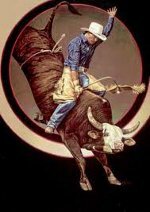 Balance, for both bullriders, rests invisibly in their extended left hands. The background of the image is foggy and unclear, like the future. Vague shadow-shapes loom from within the cloud. They look like riot police, with helmets and gas masks. Is it natural fog, smoke, or chemical crowd control? This is a future to be approached with caution. Future’s fog dissipates at the bull’s hind foot marking a distinct temporal boundary; the two foreground figures are with us squarely in the present. Our bull is not just any bull, it is Arturo Di Modica’s Charging Bull which geolocates our foreground to Bowling Green Park on Broadway, a couple of blocks south of Wall Street. The bronze bull was created as a response to the 1987 stock market crash. In a quote at the time the artist said it commemorates the “strength and power of the American people”. His bull bears a strong likeness to the corporate logo of Merrill Lynch & Co. The dancer poised so improbably atop the bull is contrast embodied: lithe in stature to the bull’s muscular mass, gravity-defying grace to the bull’s solidly earthbound four point stance, serenity atop belligerent aggression. It is the realistic rendition of the utter improbability of the dancer’s pose that triggers our dumbstruck reaction. What we see can’t be and yet our eyes say it is. The system the bull represents will never create an improbable dancer, real or imagined – the dancer’s position carries too much risk. The system of the bull is zealously risk-intolerant, the system’s smartest place bets that can never lose or they place no bets at all. Still, no matter how improbable the dancer’s pose, the fact of this image makes it conceivable. On an absolute scale of improbability the dancer’s pose barely registers when compared with the enormous improbability of life itself. It is at this somewhat shaky point that we stumble upon an articulate “message” for this word-defying image: Cultivate your imagination. There’s no solution until we first imagine it. The improbable dancer is not our answer but we’ll find our answer where we found her.